Inside the TAA’s shiny new boardroom on Caastlereagh Street. A new era is dawning at Tourism Accommodation Australia, with the organisation today revealing the purchase of new Sydney offices for its National and NSW operations. 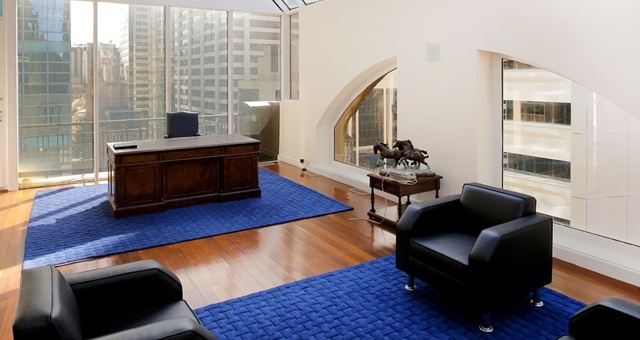 Understood to be around the $6 million mark, the new TAA offices are located in the Penthouse at Culwala Chambers on Castlereagh Street in the CBD. The move now sees the TAA break away physically in terms of office location with its partner organisation, the Australian Hotels Association, with which it currently operates in shared offices. It comes just ahead of Michael Johnson taking his place as the organisation’s new National and NSW CEO on 20 May. Highlights of the new digs include a glass atrium, interconnecting terrace for functions, full kitchen, private meeting areas and views of the city skyline. Acting TAA NSW Chief Executive, Dr Adele Lausberg, said the new premises give the TAA its own voice and allow it to stand more freely in its advocacy efforts separate to the AHA. “The deal, coinciding as it does with the appointment of Michael Johnson as the new national and NSW CEO, really does make it an exciting time for TAA and our members. It gives us a prime location in the heart of the CBD in the largest city in Australia to advocate on behalf of our membership – which has more than doubled in recent years,” Lausberg said. The TAA will move into its new offices before the end of the current financial year.